This is a really delicious, filling and healthy dish. We used whole wheat pasta and thought it tasted very good. This is great for a Friday in Lent for those who don't eat meat. The Boy even liked it... mostly (which I think is fairly high praise from him). In a small pot, combine marinara sauce and tomatoes; set over low heat and simmer for 10 minutes to allow flavors to blend. Meanwhile, in a large bowl, combine ricotta, mozzarella and Parmesan cheeses; stir to combine. Stir in egg substitute, salt, pepper and oregano. Spoon 1 cup of sauce in bottom of an 11- X 7-inch glass baking dish. 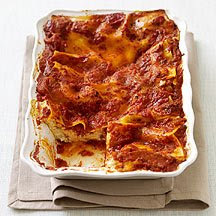 Arrange 2 lasagna noodles over sauce, down center of dish. Spread half of cheese mixture (about 1 cup) over noodles; top with pepper strips. Place 2 more noodles on top; spread with remaining cheese mixture. Top with 1 cup of marinara sauce; place remaining 2 lasagna noodles on top. Spoon remaining sauce over top and gently press down on lasagna. Cover dish loosely with aluminum foil; bake for 40 minutes. Remove foil; bake until sauce is lightly browned and noodles are tender when tested with a knife, about 10 to 15 minutes more. Remove from oven and let sit for 5 minutes to firm up slightly. Slice into 8 pieces and serve. Yields 1 piece per serving. You made me hungry! That looks soooo good!